Do curators bring value to content creators, or are they just stealing content? Hear media industry executives debate the pros and cons of web curation in the video and read the most salient comments below. Curators are the new editors. As we’re overwhelmed by an increasing number of voices and information channels, we look to curators to sort through the clutter and tell us what’s important. Publishers have a love / hate relationship with curators. Curators help to expand a publisher’s reach, but the publisher risks losing credit (and traffic). Curators who link back and republish only enough to pique interest will keep publishers happy. How does curation become a real business? Just add creation. Curators provide a valuable service to consumers and publishers. But can you charge for someone else’s content? The most compelling model going forward will be a curation / creation mix from trusted voices. For more from these thought leaders and others, download a PDF of the full publication Rebooting Media: The Digital Publishing Revolution for a Fully Social Web. In conjunction with our Rebooting Media series and the live think-tank hosted by Wetpaint and Digitas, we are releasing today the first in a series of videos about the social web. Watch the video for yourself, and read highlights of the conversation below. Search is utility, social is discovery. Search has never been about discovering something new, but rather finding what you want once you know what you want. Social, on the other hand, is all about serendipity. 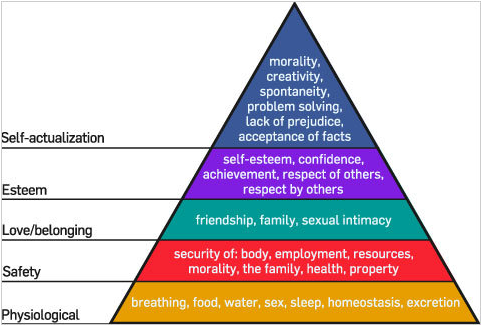 Are social users more valuable? This was surprisingly debated in the conversation, and the conversation reflected different experiences from different publishers; and reflects the difference in methods used to draw social traffic. For example, Forbes sees disproportionate traffic from LinkedIn to reach its largely male and older-skewing audience; while Wetpaint Entertainment uses the Facebook newsfeed to repeatedly reengage the site’s 1.4 million fans, almost all young women. Social is hard for marketers. While marketers recognize the promise of social marketing, the methods and measurements are far from sophisticated for most. We need to get better at understanding and tapping into unexpected virality and the seemingly random discovery paths in social. Ultimately, social and search will converge. As Google works to see if it can decipher the social code, and Facebook moves closer to taking over the entire digital world, we are headed toward a merger of search and social. For more perspective, download a PDF of the full publication Rebooting Media: The Digital Publishing Revolution for a Fully Social Web. In the last several years, “social” has gone from a college fad to become the fabric that connects the internet. And yet, even as it has taken over the wiring of the web, there is no established blueprint for what media companies should do with it. When my company Wetpaint began reinventing media for the social web last year, I went looking for the people who had all the answers. And I found out there aren’t any. But there are a lot of bright, inquisitive people who have been running their own experiments and trying to find the way forward. Wouldn’t it be great to get them all together to make a new think tank for the social web? And who better to prompt the tough questions than three leading digital media journalists? Our conversation included Jeff Bercovici (Mixed Media writer for Forbes); Jessi Hempel (Senior Writer covering tech at Fortune); and Erick Schonfeld (Editor of TechCrunch). The conversation, hosted by Digitas SVP Entertainment and Content John McCarus and me, covered three themes. We will be releasing the videos in three parts, listed below. I also encourage everyone to download the full published collection of perspectives prepared by these participants and others, available via PDF at wetpaint.com/page/thought-leadership. Living Up To Your Social Potential: How Much Social Traffic Should You Be Getting? If you’re Buzzfeed and your raison d’etre is to find and distribute viral content, then it’s fair to assume that you should be getting the majority of your traffic from social (and indeed, they do). But what if you’re Parenting Magazine? Or Consumer Reports? While we know that social traffic is increasing as a referral source for publishers, it stands to reason that social traffic would be more relevant to some publishers and less to others. When I search “how to get rid of a purple rash,” I may find an extremely useful article on WebMD (and I may even forward it to a friend with a similar problem). But am I going to post it to my Facebook wall? Doubtful. If you’re a publisher, you know how much social traffic you are drawing right now. But how much should you be drawing, relative to your competitors? To know this, we need to understand what types of content are highly shareable (and which are less so). Pew Research studied the distribution of topics on Twitter and compared them with the distribution in traditional news sources. 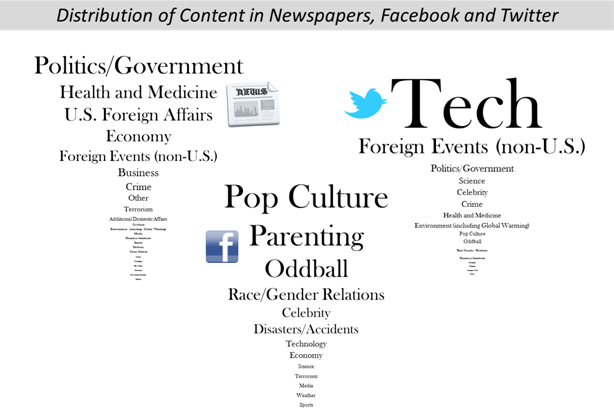 To add one more dimension, I broke down the Most Shared Articles on Facebook in 2011 by topic and threw those into the mix. Facebook users Like pop culture, parenting and weirdness. Traditional news content lines up barely at all with social sharing. None of this is to say that traditional news isn’t getting social traffic; in fact, 53% of Facebook’s Top 40 came from four very traditional news sources: CNN, New York Times, The Washington Post and The Wall Street Journal. But while much of the most shareable content comes from newspapers, the average story ends up pretty lonely. 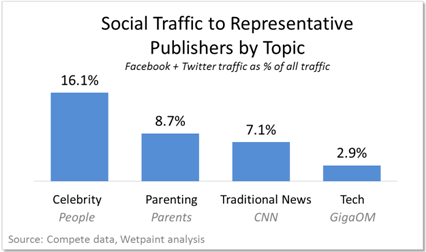 As for the most-shared topics, if you’re a publisher on the subject of parenting, you should be rolling in Facebook traffic. SEVEN of the top 40 shared articles on Facebook are about parenting (e.g. “How to Talk to Little Girls” and “Dads, Wake the Hell Up!”) If you’re a tech news publisher, well, Twitter wants to take you out for a lobster dinner and introduce you to his parents. The wheels are greased, but are these publishers living up to their social potential? Let’s just say there’s room for improvement. GigaOM gets a shockingly small amount of social traffic for a specialty publisher directly aligned with the interests of social users. Parents.com fares better and beats traditional news, but lags far behind People (even though parenting as a topic is 2x more shareable on Facebook than celebrity news). I would venture to say, of course, that ALL of these publishers should be getting more social traffic than they are right now (traditional news and celebrity gossip included). But if you’re lagging behind other publishers with less shareable content, you especially need to get smarter about using distribution channels like Facebook and Twitter. The social networks are ready for you – are you ready for them? At Wetpaint, we’ve been rapidly ramping up our social traffic (from 14% to well over 20% in the last two months) by constantly refining our social distribution system. Having content that lines up with what people like to share is only half the battle; you need to be savvy about packaging and delivering that content into the social feed. That takes not only a great editorial savvy to understand your audience, but a tech mindset to help get it into the social groove. Now that’s good news for GigaOM, Parents.com, and everyone else as well: Your content is highly shareable. Don’t let it go to waste. This is the concluding entry in a series of 10 posts about the future of the media industry contained in a report titled: Rebooting Media: The Digital Publishing Revolution for a Fully Social Web. I feel blessed and inspired to be connected to the incredible thought leaders whose insights and perspectives you’ve just read. And I’m hoping you feel challenged, provoked, and, ultimately, inspired to think about how to make the social Web a media success. Over the last year on my blog, Digital Quarters, and in my newsletter, I have shared stories, analysis and prescriptions – all in the name of driving this new digital era forward. To me, one essential principle lies deep at the heart of the rewired Internet. It is a simple and basic concept, but one that guides all the promise of the social Web: We must truly understand and delight our audiences. The social Web fully enables this concept in a way that did not exist over the last decade, much less the century before it. Indeed, never before has the data existed and been accessible – in real time, with precision and detail, and to every publisher – to know the audience and serve it well. Between usage analytics, audience data, social graphs, global Twitter feeds, and direct interactive feedback, we can receive millions of signals each minute that tell us how well we are serving and, more prescriptively, what we can do to better serve our audiences. For the publishing industry, this provides an unprecedented opportunity for content experiences to earn deep relationships with audiences who are now connected like never before. We can know our audiences, create for them, and reach them – and, in the process, make our own brands stronger and more meaningful than ever. And therein lies a path that will lead to the re- establishment of our industry’s success. The future prosperity of digital media will certainly have some things in common with its past legacy; but a host of other things will undergo massive change. What’s clear to me, though, is that the revolution in our data and connectivity-rich environment will help us create content and experiences that honor the best that our industry has ever put forth, while pushing even further. I can’t wait to work side by side with the industry’s greatest thought leaders and practitioners to make it happen. And, as we look forward, if you’d like to join the discussion, I’d welcome your thoughts, opinions, views, comments and criticisms. Please send them to me at ben@wetpaint.com. And, if you’re interested in participating in a future edition of this thought leadership gallery, by offering your take on things, I’d love to hear from you as well. This piece from Anthony Soohoo is the ninth in a series of 10 posts about the future of the media industry contained in a report titled: Rebooting Media: The Digital Publishing Revolution for a Fully Social Web. Q: How does the rise of Facebook change the relationship between media and its audience? What’s changed is how we reach users at a global level. In essence, Facebook has created an important layer of intelligent recommendations adding more relevancy than previously possible in a broadcast world. In the process, this will change how the media companies deliver their content. The downside, however, is that there’s less discovery of content going on. But the media has a real chance to build deeper relationships with users now; consumers just aren’t anonymous anymore. They – and we – know what they like, and don’t like. So, the delicate balance is this: Facebook makes discovery more challenging, but it affords us an opportunity for infinitely more personalization. And that means engagement is a lot more effective. Q: What’s changed fundamentally about media with the rise of the social Web, and what do publishers need to do to adapt? When they put content together, publishers have to determine who their influencers are. Who do they resonate most with? Then, they have to get to that group first, and build a groundswell with that audience. In the past, publishing was a broadcast type of model. Think of a bullhorn. It’s completely changed with the social Web. The key, as I’ve said, is to reach the influencers first, and then have them add to the story. That’s how you really engage an audience. Q: We’ve gone from SEO (Search Engine Optimization) to SMO (Social Media Optimization), so how will search change as the Web becomes more social? That’s a great question. First of all, I’d say we’re going to see more personalized search results. In other words, search based upon what someone’s interests are, and what a person’s friends like. It’s putting a personalized interest graph on top of search results. And the efficiency and effectiveness will improve; instead of getting 43 million results, many of which are irrelevant, you’ll get the top 20, and they’ll be of considerable interest. So, in this way, the social Web will add more meaning. The people-powered-Web will be the big driver of innovation over the next five to 10 years. Q: How do you build a brand in publishing when, with greater frequency, media is distributed through social channels? It seems to me that you have to recruit and engage your influencers. And you have to make certain you’re hitting the right audience. Finally, you have to layer content down in a very social and personalized manner. Blasting content out like a billboard takes the uniqueness out of the social Web. I believe the stories of the future will actually integrate tidbits from influencers, and they’ll also be more rhetorical and open-ended. Publishing will become more Wiki- like. People can – and will – contribute. And those contributions will matter as much as the stories themselves. The role of the editor will be to get the fire started by determining which channels and influencers are necessary to ignite the story. The editor will bring up worthy discussions across the Web and highlight them, too. This is how the stages of conversation will unfold. At first, it will be unfiltered and like the Wild West, however. Then it will get reined in, and most stories will go through a filtered version via friends or an editor. This filtering process will allow content to live a longer and richer life on the Web. Q: What are the critical success factors in publishing as we look to 2020; and who will be the winners? Facebook could be a winner. And the two guys in the garage that we don’t know about will be winners. There are five to 10 big winners that we don’t know about yet. But the critical success factors are clear: know your audience; serve users and delight them; and then go beyond this. Content will change over time; and these changes will change because of the social Web’s profound influence. What we’re really talking about here is content plus one. Anthony Soohoo is the Co-Founder & CEO of Rumpus and former SVP & GM of Entertainment at CBS Interactive. Soohoo joined CBS in 2007, when it acquired Dotspotter, a fast-growing community-powered entertainment property where he served as Co-founder & CEO. Prior to Dotspotter, Soohoo was Vice President at Yahoo!, where he was responsible for the strategy, management, development and financial performance of various business units.